(born Hastings, Nebraska, 1934.) Painter, Textile/Fiber/Weaver, Artist. At the Stedelijk Design exhibition my attention was quickly drawn to the textile area were a lot of gripping works was exhibited. Most of the items appeared very autonomous and were presented as art displayed in frames, on glass tables or hanging down from the ceiling. 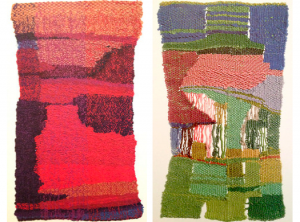 Probably the smallest section of pieces (size A4) made of colorful weaved threads caught my attention – they were made by the American artist Sheila Hicks. It is hard to say what it actually was that dragged me into her small and actually very simply and straightforward made artworks. I had the feeling of looking at a continues (paintless) painting with numerous layers. I was sure that something interesting had to be hidden behind those threads and probably made by a person with a lot of experiences and an interesting background. The Stedelijk has written an appealing text on the wall about textile as art and how the industrial movement has influenced the textile scene and how the old stereotype that textile work was women’s work has changed through the time. Sheila’s woven textile pieces are attractive because I neither could categorize the style or the period. Something in them looked familiar but at the same time like something I had never seen before, I consider it like a hybrid of different cultures and nationalities, emphasizing the use of different materials. The way it was presented was also interesting, in small frames, side by side. Very organized and strict but the threads stood out very randomly in a way. I really wonder why Sheila Hicks made these small miniatures and to understand that my research is based on her biography and her history. Sheila Hicks is educated in Fine Arts at Yale University. 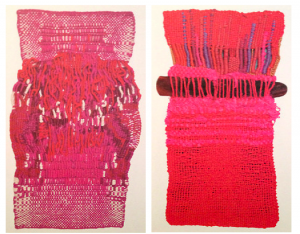 She started as a painter and turned her carrier into weaving and working with fibers – from 2 dimensional work to 3 dimensional work. Her miniatures (the ones in the Stedelijk) reflect her past as a painter as you can translate them to weaved paintings. These are works she has done through her whole career, besides that she is well known for her big weaved sculptural installations and wall decorations. In her studytime one of her professors was Josef Albers, the Bauhaus master who had settled in The United States because of the pressure of the Nazis regime. Albers was the director of the Department of Design and transplanted some of Bauhaus ideals to Yale University that is reflected in a lot of Sheilas earlier work for instance the patterns, her choice of colors and the geometry and abstraction just like the classic impression of Bauhaus. With Josef Albers [x], Sheila worked in a kind of color laboratory, and did extensive research on materials, plastics, paper, wire and plaster, that could also be one of the resons why she often weave different objects into her work. 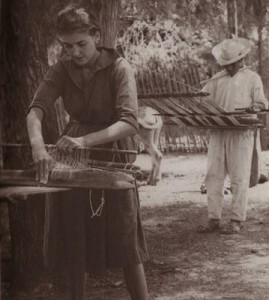 Since the 1960’s, Sheila trained in the modernistic Bauhaus tradition, as a unique way of mixing autonomous art with the traditional craft of weaving. In an interview she says: “However, when I was at Yale I had exposure to art history. I took ‘Art of Latin America,’ with Dr. George Kubler, and I chose to write about textiles because he had given a lecture showing beautiful old Peruvian mummy bundles.’’ Those textiles, she recounts, made a strong impression on her. She realized she needed to find out how they were made — not just how they looked. “At that point, Albers — Josef Albers — saw me struggling in my painting booth on improvised looms that were not looms; they were just painting stretchers that I used to tie yarns into tension, and he said he would take me home and introduce me to his wife.’’ His wife was Anni Albers [x], who is perhaps the most well-known textile artist from the 20th century. 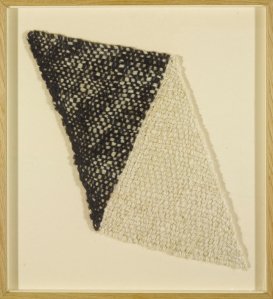 Anni Albers was a former bauhaus student and helped Sheila with a lot of work in the beginning of her carreer. 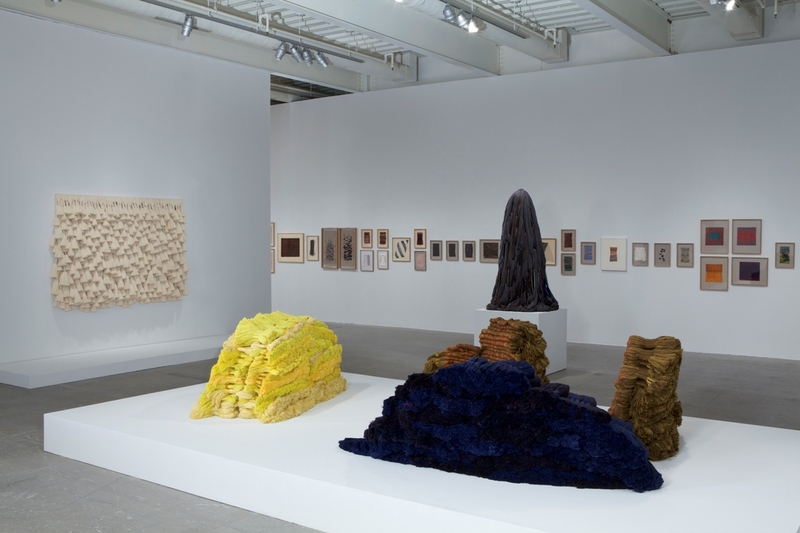 I believe that her past as a painter and her influence from Anni Albers/ Bauhaus tradition could have caused Sheila Hicks – through her whole carrier – to continually make these small, straight forward, minis/miniatures beside her other work (3 dimensional). Notwithstanding that, Hicks played an important role in the transformation of textile art during the 1960’s. Textile artists changed the dialogue and understanding of textiles as sculptural pieces in addition to two dimensional works. The story tells that Sheila is always carrying a loom – and every time she has a moment she starts weaving. As written above I find a lot of her miniatures look very ethnic, and that is probably because she has traveled a lot through her live. In the late 50s Sheila went to Chile, Mexico, India and Morocco and worked with different Local Artist. 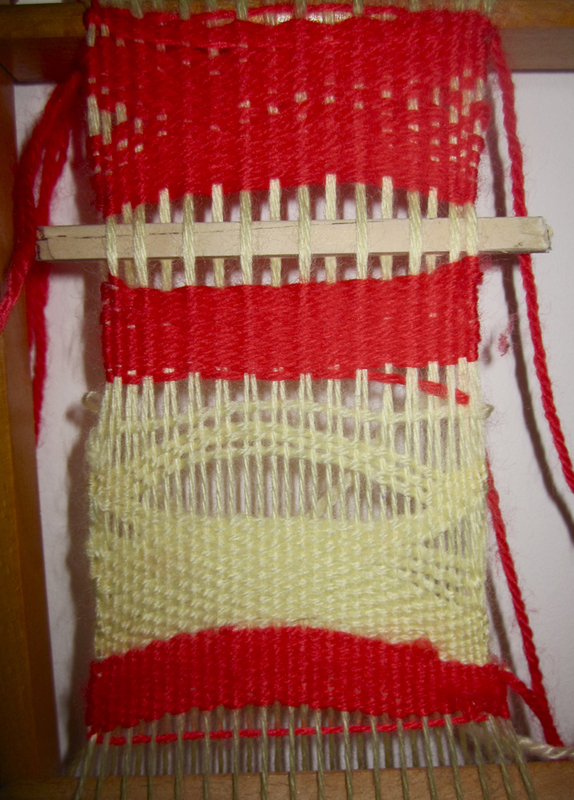 There she was inspired [x] by their weaving techniques, color theory and architecture. To understand and try to experiment myself (right image above). I found this old loom and tried to weave a miniature my self and totally understood why you can get addicted to weaving. In a way it is very meditative and when you first get a grip on it – it is very uncomplicated and just a pleasure to do. Sheila Hics miniature is a constantly sidework through her life. 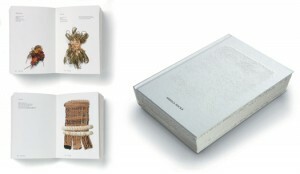 I would translate it to weaved diary paintings. It is impressing! !